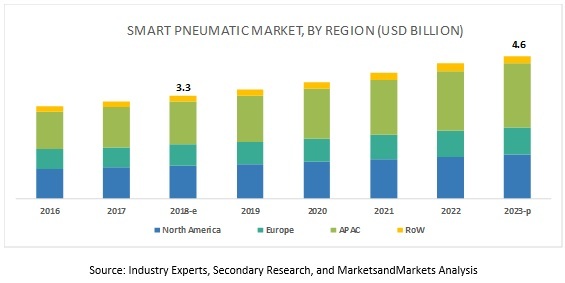 [113 Pages Report] The overall smart pneumatics market is estimated to grow from USD 3.3 billion in 2018 to USD 4.6 billion by 2023, at a CAGR of 6.7% from 2018 to 2023. The growth of this market will be propelled by growing awareness about predictive maintenance, penetration of digitization and IIoT, and need for wireless infrastructure to maintain/monitor equipment in plants. The report covers the smart pneumatics market segmented by component, type, industry, and geographic region. The smart pneumatic actuators segment is expected to hold the largest share of the smart pneumatics market by 2023. Smart pneumatic actuators use sensors and other electronics to provide operational feedback (such as speed, force, end-of-travel, stroke length, and cycle time) to controllers. The collected data enable condition monitoring to determine if an actuator is performing as intended. Beside pneumatic valves and actuators, the smart pneumatics market also includes modules or platforms that are used to monitor the operation and efficiency of a system. A module basically communicates via an I/O link with sensors on pneumatic systems, through which users can anticipate issues before they culminate to machine breakdowns. Software and services component to witness the highest CAGR during the forecast period. In the smart pneumatics market, the software and services segment is expected to grow at the highest growth rate during the forecast period. Software is an essential part of a smart pneumatic system; the raw data extracted via hardware components is collected, processed, and analyzed by software. A variety of software solutions are available in the market, working on different technologies but mostly featuring some common functions, such as data integration, diagnostic reporting, order tracking analysis, and parameter calculation. Manufacturers are focusing on offering monitoring services, in terms of extracting and analyzing the data. Automotive industry accounted for the largest market share during forecast period. The automotive industry accounted for the largest share of the smart pneumatics market in 2018. The global automotive industry is witnessing significant growth in the number of units produced per day. The machinery on the production floor needs proper maintenance to shorten production cycles and increase production output. Smart pneumatic systems play a crucial role in ensuring efficient manufacturing processes. Automotive manufacturers are also adopting IIoT systems to increase energy efficiency and monitor asset condition. This is creating a huge potential for smart pneumatics in the automotive industry. APAC held the largest share of the smart pneumatics market in 2018. The growing adoption of smart manufacturing or Industry 4.0 in various industries is creating a huge demand for smart pneumatics in the region. Besides, factors like growing focus on optimum asset utilization; stringent government regulations for workplace and personal safety; and tight quality control in the automotive, semiconductor, chemicals, and food & beverages industries are driving the demand for smart pneumatic systems in APAC. Besides, North America is a mature market for industrial automation. The region leads in terms of advanced automation technology and the use of advanced manufacturing techniques. 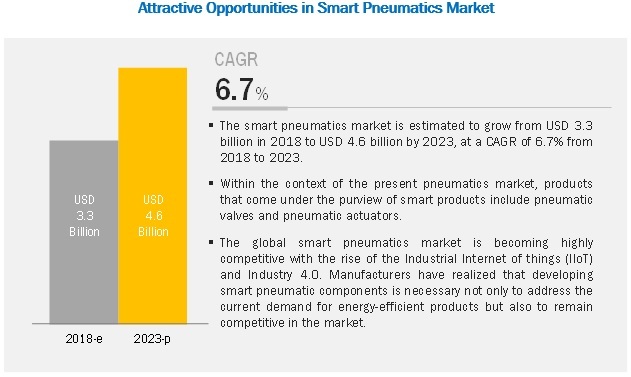 These factors contribute to the growth of the smart pneumatics market in this region. Festo is one of the prominent players in the smart pneumatics market. It manufactures factory and process automation solutions. The company offers pneumatics and electrical control and drive technology solutions. It carries over 80 years of experience in innovating motion control solutions. Its smart pneumatic product range consists of Festo Motion Terminal, which is a cyber-physical system with combined mechanics, electronics components, and software. The company has a global presence (manufacturing facilities and sales subsidiaries at multiple locations). Festo focuses on product and technology innovations to strengthen its market posture. In July 2018, Emerson Electric acquired Aventics GmbH (Germany) a global leader in smart pneumatics technologies that power machines and factory automation applications. In February 2018, Bimba Manufacturing was acquired by Norgren Ltd.’s IMI Precision Engineering business unit (US). This created a significant opportunity to enhance IMI Precision Engineering’s position in the US Industrial Automation market and grow the Bimba brand internationally. In December 2017, Thomson Industries launched smart actuators with integrated electronics, such as sensors and communications technologies, to meet the demand for improved connectivity, application flexibility, and cost efficiency as well as to build smart machines for factory automation applications. In March 2017, Festo launched the VTEM Motion Terminal–a system intended to help transform a pneumatic product into an Industry 4.0 component. Will suppliers continue to explore new avenues for smart pneumatics? What are the adjacencies that companies can leverage or explore? Most suppliers adopt agreements, partnerships, contracts, and collaborations as key growth strategies (as seen from their recent developments); where will these take the industry in the mid to long term? 8.4.1 Proper Operation and Maintenance of Pneumatic Systems Contribute to the Smooth Operation of Water/Wastewater Facilities. The study involved 4 major activities in estimating the market size for smart pneumatics. Exhaustive secondary research has been conducted to collect information on the market, peer market, and parent market. Validation of these findings, assumptions with industry experts across the value chain through primary research has been the next step. Both top-down and bottom-up approaches have been employed to estimate the complete market size. After that, market breakdown and data triangulation procedures have been used to estimate the market size of each segment and subsegment. In the secondary research process, various secondary sources have been referred to for identifying and collecting information for this study. Secondary sources include government sources; corporate filings (such as annual reports, investor presentations, and financial statements); and trade, business, and professional associations. The secondary data has been collected and analyzed to arrive at the overall market size, which has been further validated through primary research. 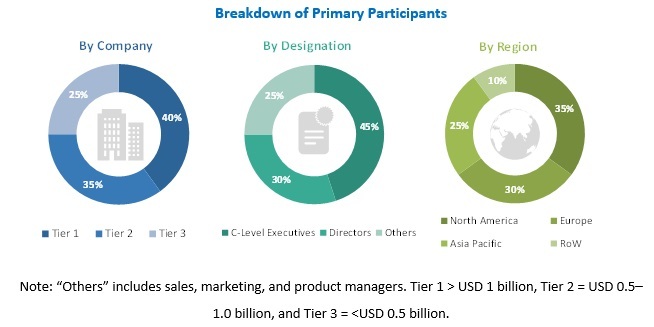 The smart pneumatics market comprises several stakeholders such as associations and industrial bodies, pneumatic system manufacturers, pneumatic system distributors and providers, manufacturers, research organizations and consulting companies, and technology investors. Extensive primary research has been conducted after understanding and analyzing the smart pneumatics market through secondary research. Several primary interviews have been conducted with market experts from both the demand- and supply-side vendors from across 4 regions North America, Europe, APAC, and RoW. Approximately 20% of the primary interviews have been conducted with the demand side and 80% with the supply side. This primary data has been collected through questionnaires, emails, and telephonic interviews. After arriving at the overall market size using the market size estimation processes explained above the market has been split into several segments and subsegments. To complete the overall market engineering process and arrive at the exact statistics of each market segment and subsegment, data triangulation and market breakdown procedures have been employed, wherever applicable. The data has been triangulated by studying various factors and trends from both the demand and supply sides. Emerson Electric Co. (US), Festo AG & Co. KG (Germany), Parker Hannifin Corporation (US), Bimba Manufacturing Co. (US). Total 10 major players covered.